The Alexandra Nurseries is a quirky and extraordinary venue available to hire for a limited number of exclusive events each year. 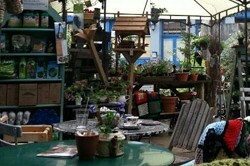 By day a bustling garden centre, shop and café. By night transforming into a magical space set with fairy lights, candles and the aroma of flowers and herbs. 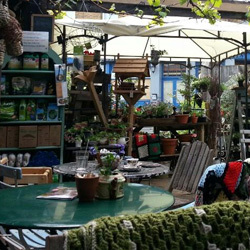 Situated a stones throw from Crystal Palace Park in SE London, it is an Oasis of calm in an otherwise busy small town. Nestled slightly off the beaten track, with an eclectic mix of stained glass, vintage pots, tools & old ladders laden with plants, something new is to be spotted in every nook and cranny. This is an outside venue, with permanent covered seating for 30. Further space is available under a bespoke canvas cover, providing additional room for a band and dance floor or extra seating if required. Furniture can be stored or moved, leaving a versatile space for your own creation and ideals. The Suzanne James team will set the venue up on the day, as agreed in advance using the on site kitchen for preparation and storage.